Are You Planning Your Wedding? - Jon S. Henricksen, P.C.Jon S. Henricksen, P.C. You’ve found the love of your life and have set the date. Well done! You’ve told your family and friends about your upcoming marriage. And now you’ve got to plan it! The details might seem as if they’ll drown you. From the selection of the venue to the guest lists. From the budget to the flowers. From the asking of the best man and maid (or matron) of honor and to have a flower girl or ring bearer? Place cards? Live music or DJ? Where to register for gifts? The gowns and tuxedos or the shorts and flip-flops? The menu! Chicken, beef, seafood? What about the vegetarians and vegans in your circle? And the invitations. Calligraphy or home printing? Something formal or something uber casual? The photographer and videographer. The limousines? And there’s so much more. You might have talked this through a million times and gotten more asked, or unasked, advice from everyone you know. After all, this is a day you’ll never forget. And you want to get it just right. You’d be surprised how many people simply forget to find someone to make it official! If you’re having your wedding in the church or temple or synagogue that you attend, you have no doubt selected the person who leads the congregation. But what if you’re planning to hold your celebration someplace else? Or what if you’re planning a wedding just for the two of you? You want to keep it intimate and private, or your budget won’t accommodate a blow-out, or perhaps you view this as just a formability. There are many reasons for the kind of wedding you want to have. There are almost as many reasons as there are people having them. 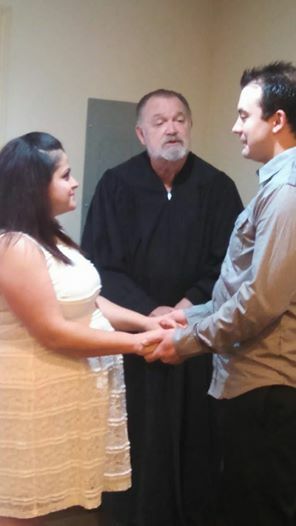 Judge Jon S Henricksen would be delighted to perform your wedding just as you would like it. In the past 37 years, Jon has joined literally thousands of couples all over the Portland Metropolitan area. From his office to the most upscale hotels and the great outdoors he has tailored ceremonies that reflect the uniqueness of each couple. He would be honored to do this for you. And after 37 years, nothing surprises him! Please call us at 503.655.7555 so that we may begin planning your very special day. Nothing would please us more.